In celebration of the Centennial of Historic New England, the fall 2010 Appleton Circle European Adventure was to Lisbon, Portugal. During our September 30-October 6 visit the Portuguese celebrated the 100th anniversary of the creation of their republic. Our travel program visited museums and private locations, with emphasis on the architecture, gardens, decorative and fine arts, food, and culture of Lisbon, and on museum practices and historic preservation. Travelers were welcomed and guided by museum directors, cultural officials, and the new French Ambassador, who welcomed us to his private home in an eighteenth-century palace. Lisbon was largely destroyed by an earthquake in 1755, so much of the city that exists today dates from the late eighteenth to mid-nineteenth centuries. The historic Lapa Palace Hotel provided the base for the trip. The hotel features views over beautiful gardens to the Tagus River, where the Queen Mary 2 made an appearance during our stay. Among the visits made by the Appleton Circle group was a stop at the Fundaçaão Ricardo do Espirito Santo Silva, a foundation that operates a house museum but also a craft program working to sustain traditional craft practices. Fourteen crafts are taught in the workshops, which closely resemble those of Boston’s North Bennet Street School. From tapestries at the Museu Nacional de Arte Antiga to paintings and jewelry at the Medeiros e Almeida collection, the rich design heritage of Portugal was explored. Seventeenth-century architecture was highlighted at the Jerónimos Monastery, while the Pena palace in historic Sintra displayed nineteenth-century design excesses. At the Ajuda National Palace, Director Doctora Isabel Silveira Godinho discussed how she uses techniques learned from American museums to remain “cutting edge” among Portuguese museums. These include the use of volunteers, a museum store program, and corporate sponsorships. The director and the long-time textile curator were our hosts at the Gulbenkain Foundation Museum, recently named one of the ten best small museums in the world. The collection is known for its rarity and quality, and is handsomely displayed. A special experience was an evening visit to one of the palaces built for the Marquis of Pombal, the architect of Lisbon’s rebirth following the earthquake. The city-owned building was turned over to a young group of artists who established a contemporary art program named Carpe Diem. While using the space for studios and creation of installation art, they are also working to restore the palace. Intrepid Appleton Circle travelers journeyed from attic to basements to see restoration work in progress and the art. An optional visit to a house museum took us to the Casa-Museu Dr. Anástacio Gonçalves, the home of a collector that earlier served as an artist’s residence and studios. Located along the “New Avenues” of the city, the house was built in the early twentieth century in the Art Nouveau style. The museum is proud of its services to the blind and of workshops for children. Among many other visits and experiences too numerous to describe, a highlight for many of the travelers was an evening at the home of the owner of the Bacalhoa vineyards. Mr. José Berardo is one of the foremost collectors in Portugal, and his Palácio da Bacalhôa reflects his interests in both ancient and contemporary art. A twilight walk in the gardens with views back to Lisbon was followed by cocktails on one palace terrace and dinner on another, after tours of the private quarters. 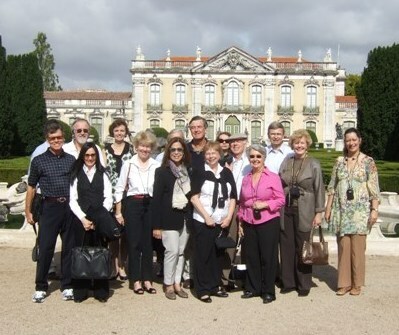 On the national holiday, Appleton Circle travelers were treated to a private visit to the Royal Palace of Queluz and its renowned gardens, closed to the public for the day. The challenges of restoration and maintenance of eighteenth-century landscapes and buildings were among the topics discussed in this beautiful location. The Michelin-starred restaurant Eleven provided a fitting location for the final evening of the trip, with a private room overlooking the whole of the city from huge windows on three sides. As dinner was served, 100th anniversary fireworks erupted in the background to celebrate the anniversary of the republic, and—for our travelers—the mission, vision and 100th anniversary of Historic New England. View a photo gallery of the Appleton Circle Adventure in Lisbon.